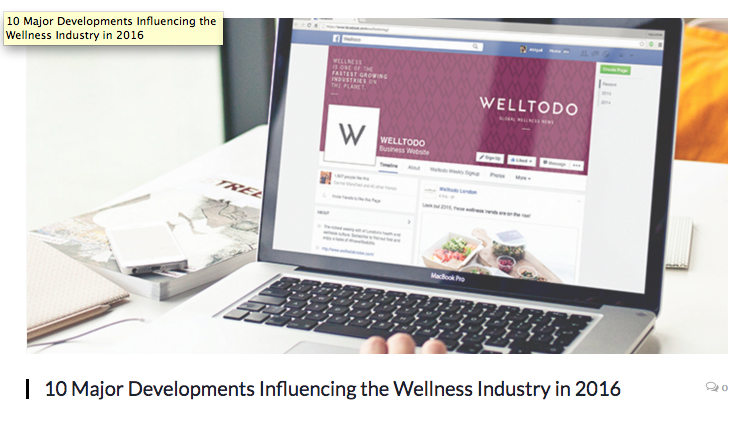 WellToDo is one on our go-to spots for insights on the wellness industry here at Feedr, and as we approach the final stretch of the year, we spent a little bit of time reflecting on their expectations for trends in 2016. Back in January, WellToDo reflected on the way in which wellness has permeated through multiple industries challenging the long-persisting relationship between fashion, fitness, food and even our own self-construal. We see this through things such as an explosion in hashtags including #cleaneating and #healthyliving on Instagram and other platforms, and we’re starting to see a shift in mainstream attitudes too. WellToDo highlighted health magazines joining the trend by bidding farewell to covers promoting ‘bikini bodies’ and ‘drop two dress sizes’. The movement away from unachievable or unsustainable goals of our ‘ideal self’ makes room for proper understanding of how wellness can increase happiness, energy levels and longevity. Other trends highlighted included how wellness has started to attract the attention of big brands in a serious way, and to bring in record amounts of investment. Wellness has moved from being a part-time activity or a weekend warrior approach to something that people really try to integrate into all areas of their lifestyle, and big business is taking notice. Due in part to this public change in attitude, companies have begun to jump on the bandwagon and the push for workplace wellness is increasing – what was once regarded as an arbitrary obligation for HR departments to implement has finally become appreciated and executed as a manner of employers demonstrating their value and concern for employees. However, many companies still struggle to find ways to implement workplace wellness programs that actually have an effect and benefit their employees in the long run. All of these trends together highlight why we’re excited that Feedr has launched this year, and why we think making better food accessible to people where they work is important for individuals as well as employers. Watch this space in the coming months as we highlight other trends in the wellness space, and reflect on the relationship between food, wellness and the workplace.